i-touch fingerprint access panel and keypad can be used to control biometric access to a garage door through our Autocloser or i-access products, or to any door controlled by a generic electronic strike or magnetic lock device. Access can be granted using fingerprint verification or permanent or temporary keycodes. Up to 30 fingerprints can be recognized. 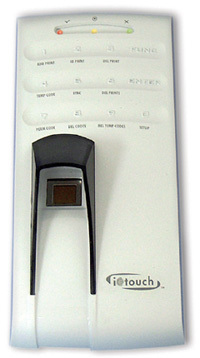 Key codes entered can be permanent or set to expire after a specified time period. i-acccess provides for an optional manual exit button to allow easy exit from the secured area. Installation requires only 20-30 minutes. i-touchs sleek yet rugged design makes it suitable for interior or exterior use. Requires an Autocloser or i-access unit and a 110V outlet. Affordably upgrade your security system today with cutting edge biometric access using the i-touch™! For pricing and availability information, please call 1-877-SHUTDOOR.